Rosmarinus officinalis should be a simple plant to explain. It’s easy enough to describe: an evergreen shrub native to the Mediterranean with dark green, needlelike leaves that have a resinous aroma. From late winter through spring, the plant displays blue flowers. There are two basic types: upright forms useful as shrubs, and prostrate types that will spill down slopes and cascade over walls. So far, so good. Care is also straightforward. Once rosemary is established, occasional deep watering is almost all it needs. Prune lightly to shape, if desired. Feed little, if at all. The plants will endure drought, heat, wind, and salt spray. Insects leave them alone (the aromatic oils in the foliage act as a natural repellent). And deer and rabbits don’t like the taste. Rosemary has only two weaknesses. It is somewhat tender―most varieties suffer damage when temperatures dip below the teens. And it is susceptible to root rot―usually a consequence of poor drainage, often exacerbated by overwatering. Now comes the tricky part: distinguishing between the many varieties on the market. They don’t look much different in nursery containers, and catalog descriptions sound similar too. The fact that one variety may be sold under several names (for example, ‘Collingwood Ingram’, ‘Ingramii’, and ‘Benenden Blue’ are all the same plant) adds to the confusion. To sort out the differences, we spoke with expert growers. They recommended the varieties listed below. ‘Tuscan Blue’, 6 to 7 feet tall. Leaves are wider than average and very aromatic; dark blue flowers. Good shrub for many situations. “The workhorse of the industry,” says David Fross of Native Sons Nursery (wholesale only), in Arroyo Grande, California. ‘Miss Jessup’s Upright’, 4 to 6 feet tall and about half as wide. Slender branches; pale blue flowers. Good choice for formal herb garden or confined spaces. ‘Gorizia’, 4 to 5 feet tall and nearly as wide. Stiffly upright and rather open form. Leaves are larger, longer, and brighter green than typical; pale blue flowers. Good specimen or accent plant. “Very architectural-looking,” says Jeff Rosendale of Sierra Azul Nursery & Garden, in Watsonville, California. ‘Golden Rain’ (‘Joyce DeBaggio’), 2 to 3 feet tall and as wide. Yellow gold leaves; dark blue flowers. Use for contrast against darker green foliage. ‘Boule’, 3 feet tall and wide. A new introduction from Native Sons, it forms a neat dome (boule means “ball” in French). ‘Collingwood Ingram’ (‘Ingramii’ or ‘Benenden Blue’), 2 to 2 1/2 feet tall and 4 feet wide or wider. “Because it’s always putting out new side growth, you never see woody trunk,” says Mulligan. This habit makes it well suited for slopes (the garden shown on page 78 is a good example). 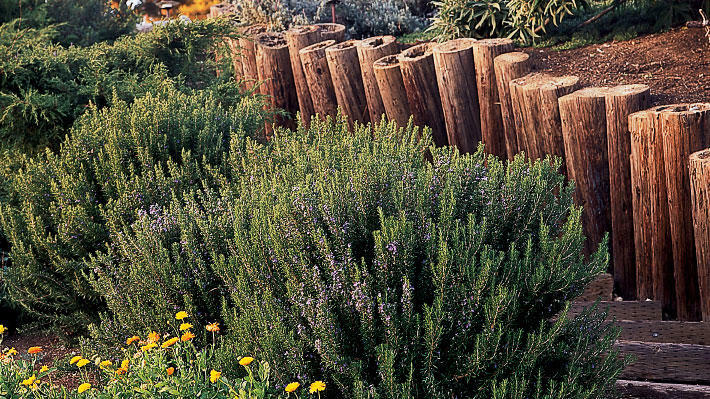 This rosemary also mixes nicely with ceanothus, rockrose, and other drought-tolerant shrubs. ‘Ken Taylor’. Similar to ‘Collingwood Ingram’ but slightly shorter and somewhat trailing. Showy dark blue flowers. Best on slopes. Sensitive to root rot. ‘Prostratus’, 2 feet tall and 4 to 8 feet wide. Pale blue flowers. 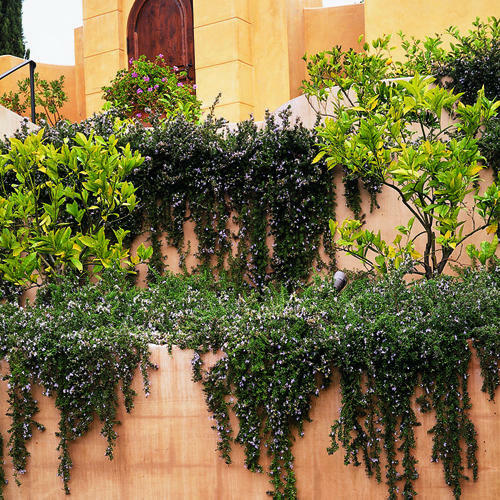 Most commonly used rosemary for cascading down walls, as in the photo at left of the garden designed by Carole McElwee of Capistrano Beach, California. Fairly frost tender. ‘Irene’, 1 1/2 feet tall; spreads 2 to 3 feet per year. More hummocky form than ‘Prostratus’ or ‘Huntington Carpet’ (see below). Showy violet blue flowers. Good choice for draping slopes or walls. Hardier (to 15°) than most trailing types. ‘Huntington Carpet’ (‘Huntington Blue’). About half as tall and wide as ‘Prostratus’ (above). Leaf nodes are closer, so the ground cover has a denser appearance. Pale blue flowers. Excellent choice for covering slopes or trailing down walls. ‘Arp’, 4 feet tall and wide. Rather open habit but can be kept denser with frequent pruning. Gray green leaves; bright blue flowers. Hardy to -10°. ‘Hill Hardy’ (‘Madalene Hill’), 3 to 5 feet tall and as wide. Foliage denser and brighter green than ‘Arp’. Hardy to at least 0°. ‘Salem’, 2 feet tall and wide. Fairly tolerant of wet soil, it’s a popular choice in moist areas of the Pacific Northwest. You can use any R. officinalis for cooking, but upright kinds with broader leaves contain more aromatic oil. ‘Tuscan Blue’ is the favorite of many chefs, but ‘Blue Spires’ and ‘Miss Jessup’s Upright’ are also good. So is ‘Spice Island’, which is normally sold in the herb section; it grows into an upright, 4- to 5-foot-tall shrub. Garden centers and nurseries may carry only a few kinds of rosemary, but most can usually order other varieties from wholesale growers on request. Or order plants from the following mail-order suppliers. Forestfarm: www.forestfarm.com or (541) 846-7269. Sells ‘Arp’, ‘Blue Spires’, ‘Golden Rain’, ‘Spice Island’, and ‘Tuscan Blue’. Goodwin Creek Gardens: www.goodwincreekgardens.com (800) 846-7359. Sells ‘Arp’, ‘Blue Spires’, ‘Collingwood Ingram’, ‘Golden Rain’, ‘Gorizia’, ‘Hill Hardy’, ‘Miss Jessup’s Upright’, ‘Prostratus’, and ‘Tuscan Blue’. Mountain Valley Growers: www.mountainvalleygrowers.com or (559) 338-2775. Sells ‘Arp,’ ‘Golden Rain’, ‘Hill Hardy’, and ‘Spice Island’. Territorial Seed Company: www.territorialseed.com or (541) 942-9547. Sells ‘Arp’ and ‘Salem’.